Secret Golf's Steve Elkington travels to Alabama to talk turf with the owner and the superintendent of FarmLinks. [MUSIC PLAYING] -On this episode, The Rural Golfer travels west to FarmLinks at Pursell farms to discover their secret in the turf. 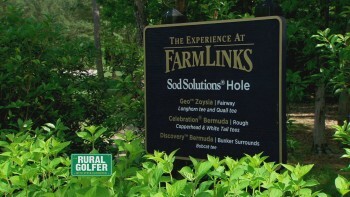 -The golf course FarmLinks is truly the world's first research and demonstration golf course. Research-- because there were a lot of different companies that we would actually do formal research on and then demonstration of some of the coolest technologies out there. -We dig into the science of golf course management and see how innovations in the industry make it fun to watch grass grow. -Are they were reducing water usage? Are there reducing pesticide usage? Are they-- you know, have a difference in mowing frequency? Do they also provide you better shade tolerance or traffic tolerance or are any of those variables? -Once you get up there, ground temperature up to 70-- shoot, you can cut twice a day almost in summer. -Oh, yeah. You're constantly cutting grass. -There's a lot of technology going on there with mowers where you can laser sharpen them now. -Me and my team can get these grains stimping 12s by single cut rolling and the proper nutrient water management. -I aced it right out-- right up-- right on camera right here. -Here it comes. Here it comes. THEME SONG: We've got the Big Show revvin', a-ridin' on the map. Where we're going next we just can't say. Let's ride the clubs! Let's hit some balls! We're making friends and playing golf. The Rural Golfer's coming your way! -There was a time when there was only dirt. And as far as golf went, no one ever considered the secrets it held. Greener pastures in the game had yet to appear on the horizon. When the visions of the game's forefathers were drawn with a stick in that dirt, the original courses followed. There was no grass to choose from, no chemicals, no seeds, no earth-altering machines. What the natural land produced was the extent of the layout and design. And most courses were strewn across farmland and other open fields. But as time passed and interest in the game grew, so, too, did technological advances. Much like the progression of golf equipment, today the science and technology behind the creation of the best turf on a course is producing nothing but greener pastures for the game. -We're at FarmLinks today. This is one of the greatest turf experimental places in the whole United States for sure, could be in the whole world. 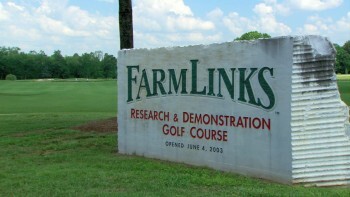 -The golf course FarmLinks is truly the world's first research and demonstration golf course. Research-- because there were a lot of different companies, including ourselves, that we would actually do formal research on, and then demonstration of some of the coolest technologies out there. -Pretty neat how that does that it, isn't it? -And the payoff for the research and demonstration has resulted in Pursell Technologies being regarded as one of the biggest innovators in the agronomy industry. -In 1904 when my great-grandfather started the company, all fertilizer came out of the back end of an animal. So the worst it smelled, the better it was. We started out in agriculture and ended up in golf and ornamental nursery. We came up with a technology called POLYON that was very, very different. It was patented. And it was all made in a small town, Sylacauga, Alabama, where I grew up. And the fertilizer itself is just a kind of a small sphere, and then we put a polymer coating on top of that. And depending upon the thickness is how long that product will last. We wanted to draw golf course superintendents from all around, not just to see our fertilizer product in action on a real live golf course, but to get to know them. And we bring in about 1,000 golf course superintendents a year. -We are known throughout the industry by their superintendents, you know. A lot of them have been to FarmLinks and experienced FarmLinks. -You have these big events, these big vendors come in, and they test. This is their laboratory. Where if we get a good machine at our club back in [INAUDIBLE] it may have gone through a testing process here. Is that what you're saying? -Absolutely. It could be turf. It could be equipment. It can be a various-- numerous things. Products that can be used in other facilities to improve or to save money or to give better conditions at the end of the day. -Just the expertise that has kind of grown in this turf world-- it's just unbelievable. -Maintaining, and improving upon, championship golf course turf requires highly specialized turf experts. Although every hole on every course is different, the quality and care with which Pursell Farms grows their grass is a uniformity that's making people notice. -When we decided to build FarmLinks, I started trying to come up with something that would indicate being out on a farm. So I said, OK, well, maybe we can come up with an intimidating farm animal. I knew I couldn't do a chicken or a goat or a sheep or something like that. So I came up with a longhorn. And the funny thing is is that we got within about three months of opening, and we did not have the first longhorn on the farm. We started off with 18 and now we've got about 100. They're the most protected herd of longhorns in the country, because all they do is sit up to your right when you drive in that front pasture. And they promote the brand. -You want to invent grass greens here, right? -Let's have a look at that. So you've got to have a lean piece of grass to be very thin and to be able to roll the ball over it fast. So you'll see guys like at Augusta and these places all top dress it, like three days before the tournament, very light dusting of sand, which is it the reason the sand goes on. Then the grass has to struggle to get up a little bit. And then they want to cut him off and they give him no water, no food. And that blade comes up a lot thinner. And that's how you can get the ball to be really fast, right? -I'm a turf guy. I feel like I'm in the know-- and I didn't know this place existed. There's so many things that have come out of this property that you guys have discovered. Your laboratory of such-- of all you've got 21 different grasses on the golf course. You see which ones work where, and you pass that along to the public. How do they make a new strain of grass? -Well, sometimes they can manipulate it in a lab, but most of the time these selections are taken out-- there's a big sod farm, or a big field. And you see these off types or different varieties. And they'll go out, and they'll make a selection. Now the key to that is will that grass remain stable in that state, or will it change back to what it originally was? They spend a lot of time and a lot of years of watching these plants and making sure a lot of times that they remain stable. -As strides in turf management continue, specialists capitalize on the market's most cutting edge products and are doing so with Mother Nature in mind. -Are they reducing water usage? Are they reducing pesticide usage? Are they-- you know, have a difference in mowing frequency? Do they also provide you better shade tolerance or traffic tolerance or are any of those variables? So that's why we're selecting some of these different grasses. -And what you specialize in down here on this golf course is you test all these different grasses under all sort of different circumstances. But on this hole-- this a hole that I want to talk about, because it's zoysiagrass and I have emerald zoysia in my yard. And a lot of people that come to my house, Mark, and they look at my yard and they go ah. That looks awesome. There's no way I could grow that. But I think one of the things that we're going to learn today-- I think, yes! Absolutely you can grow it. These grasses are easy to grow. -Absolutely. Zoysias, actually-- to me-- are probably a little bit easier than some of the Bermudas. -This is your regular zoysia. And you can see the blade of the grass is-- you know-- it's a bigger blade. And now this is the dwarf-- smaller, thinner blade, squished down more. And the zoysia is a very firm grass, so it supports the weight of the ball so easily. I mean, there's probably like two dimples touching the grass there. -You know, there's something else interesting about zoysias, that-- I think from an architectural standpoint. The courses play longer with zoysia. -With grass being such a critical role in how golf is played today, advancements in landscaping help determine which grass is most suitable for each individual course. -We've seen ones that you can cut once a month. What could be better than that? -Yep. The Discovery Bermuda-- it's a vacationer's dream. They can go away on vacation and not have to worry about their lawn. You see the shade here. This is Discovery. -This is a once a month cutter? -Yeah. We're putting it in a lot of areas right now to see how far we can take it. How much shade can it handle? -How do these grasses live together like that? That's the Bermuda grass just throwing a runner right into there. -It depends. It depends on the environment. It depends on the height of cut. -Well that zoysia can go uphill. -The zoysia will move in, especially-- it will compete a little bit better in the shade. -Growing turf is a lot like playing the game. The best thing to do is simply-- well, keep it simple. -The more you start to think and the more you start to do-- probably the worse you're going to make it. Go back to the basics. Always stay simple, and you don't have to get real tricky and try so many different things. You just-- you stay consistent. You know what turf needs. It needs the proper fertility. It needs the proper nutrients. It needs the proper air movement and the proper oxygen in the root zone. And just keep it really simple. -Oh yeah. He's always ready. -Let's go find another snake. -I aced it. Right out-- right out-- right on camera right here. Here it comes. David? -Oh I like it. This could turn out better than mine. I think we should go down and putt those. The golf god's with you because you designed this, and you deserved that kind of shot under that kind of pressure. I told him to go ahead and make that. Now you've put the pressure on me. One down. -Take your hat off. We're done. -Oh we're done? I thought we had two more holes. -You've had a really harsh winter here. -We've had a very harsh winter, probably the worst winter that we've had in 20 plus years. And this year coming through the winter we knew it was going to be difficult. The severe cold temperatures that extended for 48, 72 hours at a time-- we really saw a delay. And we saw warm season Bermuda grasses, zoysia grasses that really struggled coming out. Typically, we would be fully green, really rolling along by mid, late April. This year we're a full month and a half behind. -The turf is almost like deciduous. It has a down time. -Absolutely. It needs a down time. -It needs a down time. It drops a lot of its bulk and goes brown. -We've got a new product that's called Pigments. And we're able to take these pigments, and we're able to spray our Bermuda grasses and our zoysia grasses. We're able to maintain color. It kind of locks the chlorophyll in the plant. So you can get into December and January and have zoysias and Bermuda and still have color and still stripe it. -Yeah, and maybe leave the rough brown to get a little contrast. -[INAUDIBLE] completely dormant. Yeah. Yeah. -Once you get up there, ground temperature up to 70-- shoot, you can cut twice a day almost in the summer. -Oh yeah. You're constantly cutting grass. -There's a lot of technology going on there with mowers where you can laser sharpen them now. [INAUDIBLE] got a laser sharpener. And you know I like that. I like that move to cut my-- I like to get it as low as possible. Just because it's fun to see it. -Well, it's a much cleaner cut. With the scissor action of the real [INAUDIBLE] knife, it gives you a much cleaner cut so you don't have the injury on that leaf tip. With the rotary, you'll get a little injury. With our Bermuda grasses in the rough area, we'll always-- we'll rotary them. Because they can tolerate it, and then the rotaries have gotten much better. But when you're mowing these lower heights cut 3/4 of an inch or lower, if you want the ultimate cut, you're right [INAUDIBLE]. -People from all over the world come here to learn about turf and cutting, and all the equipment gets tested here. -What's the latest, greatest this year? -Tier four hit the golf course industry. So all of the major manufacturers had to develop an engine that met the emissions and the Tier 4 standards. This is the 8000, which is like a triplex on steroids. It's got five smaller cutting units. So it really follows undulations really well. So what we've got here is a old-new technology. Got an old sprayer with the latest technology and GPS. And he's spraying right now a loop around the outside of this fairway. And it will actually create a GPS map. So that when he goes back and sprays the remainder of the fairway, each individual nozzle will come off and on so that he doesn't have any overapplication or any going to x-ray. He then can look at his monitor and see that map and make discernment whether or not he skipped an area. If he skipped an area, all he's got to do is drive back across that area and the sprayer will automatically kick the nozzle on in that location so that we can get that material applied. It also has self-steering capability. So that once he makes his turn around, he can line it up, let go of the steering wheel, and it will automatically move the sprayer right or left-- keeping him on the path so that we are making really precise applications. Another feature that's nice with this is that as he goes outside of the boundary area, it'll automatically shut the nozzles down. So we're not over applying outside of a targeted area. -Good one. What would be really embarrassing is if I had to buy you lunch at your place. That would be embarrassing. Take that, David. Any comment? -All I can say is you're still one down. I am-- I'm a smart golfer, you know. I like to kind of lay up and hit the wedge in there. [INAUDIBLE]. -Same spot you were in on that other hole where you just snuck in a 5 iron over there and then just sank a 25 footer. -Well, I mean there are a lot of ways to make birdie. That's one of them. The other is to hit it close and then miss your putt and you make par. -Yeah, I was distracted. I was distracted by your putt. That's what I was distracted by. -These greens, I imagine, when Mark wants to get 'em quick, he can make 'em real quick. -Maybe not that far left. That's OK.
-All right, I think it's going to g0-- curve over that to the right, will it? Is it tied? -Is that an owner's gimme there? -Yeah that's an owner's gimme. All right. Last hole. You do have a restaurant of some kind here, don't you? -Yeah. Oh yeah we do. Yeah. -Got food and all that? -Me and my team can get these grains stimping twelves by single cut rolling and the proper nutrient and water management. -A stimp meter is the tool superintendents use to measure the speed of the greens by applying a force to a golf ball, and then tracking the distance it travels. -12-- for anybody who plays out here, just an average golfer-- they can't handle it. -I've putted at Augusta when they were at 16 on a weekend, and I'm telling you right now-- you don't want any part of 16. Every-- every putt is a potential disaster to cut off. -And the announcers talk about 11, 11 and 1/2, 12s, 13s, and maybe it's an ego thing that they-- oh I want to putt fast greens. But then I come out here and watch them when we get these things up at that 11 or up at 12 and they struggle terribly. And Dr. Thomas Nickel out at Michigan State did a research study on green speeds. And he actually found that 9 and 1/2, 10 is what most golfers really prefer. -You go. Even though it's my honor. You go. -That's as good as I can do. Whoa baby. Pushed it out a little. -Aw, you'll be all right. I'm trying to maybe have my only professional win in my life. -Professional win? You know I haven't had any lately either. -Look at that for control. These guys are good. Oh you got one of those testy putts. -Yeah. Four footer, too. I love it. That's what I want. I want to be tested today. -That's nice. Oh ho ho ho ho ho. Where was the-- where was the pro spin? The check? -OK tell you what. Oh. That wasn't an easy putt. I could tell you that. Nice. -You want to putt that again? Just for B roll? -Yes. Let's call it a tie. Let's call it a tie. Thank you, David. Thank you. Thanks for having us out here. This is a wonderful, wonderful place. I know one thing for sure-- I'm coming back. When the [INAUDIBLE] is ready. -There's no rush. It's only-- we're creating this energy on the back sweep. Wind, explosion. Right? -Freedom Golf Association-- it's mission is to help the disabled enjoy the game of golf. -Elk meets EQ and friends, and listens to their inspiring stories. -I ended up in the emergency room. I went through 12 surgeries and left them two months later as a triple amputee. -They put my club in my hand. He said hit a ball. I said are you sure about that? Because I haven't hit a ball and I don't know if I can balance yet. I hit the ball pretty good! Now all of a sudden you just light up. You get excited. -I like that a lot. -in their recovery. Before I lost my leg I was like this. Now I'm like this. I see! -There you go. That was better.